As the short-sized woman that I am, I have to agree when people say good things come in small packages. Perhaps this is not valid to all things or people, but in the case of cupcakes, it is. No matter your age, gender or culture, cupcakes are one of those wonderful shared pleasures we all enjoy. Even the name is cute and right to the point. A cake in a cup. As it is to bake them, it is even more fun to eat them. But then, who really has the time? Luckily, we have Michelle Cupcakes in town. Since 2009, Michelle and her team have been pleasing the sweet tooth of young and older Zurich crowds. Red velvet – my favorite for its dramatic character – vanilla, chocolate mint, carrot and cream cheese, and seasonal specials like Chai are among some of the flavors available in two different sizes, regular and bite-size – for people like me who want to try them all. 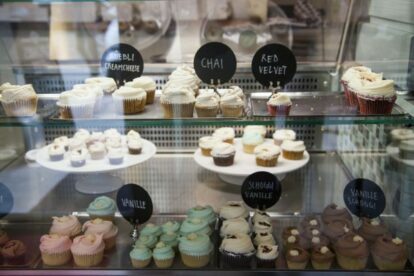 The cupcakes are made fresh daily and the flavors are simple, but well executed. The decoration is humble to keep that homemade flair and not make them look like pieces of art, but for what they are, a delicious treat made of moist cake and velvety frosting. You can also customize your cupcake order ahead of time for an out-of-the-box gift idea or just to make someone happy. As a very wise person once said: I’ve never met a problem a proper cupcake couldn’t fix. I could not agree more.